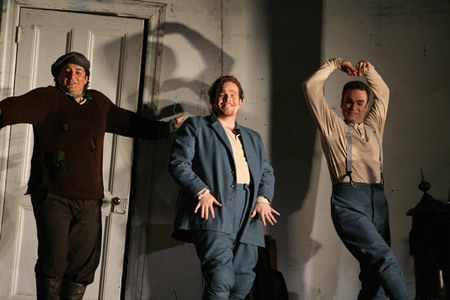 Nikolay Didenko as Colline, Garrett Sorenson as Rodolfo and Joshua Hopkins as Marcello. Remember when poverty was romantic? La bohème, the ultimate homage to a risky but free-wheeling lifestyle, came out in top form during Houston Grand Opera’s recent production of Puccini’s masterpiece. There’s something remarkably timely about reconsidering bohème at the moment with an tanking economy and looming world food shortage on the radar. Whether it’s Paris or Pennsylvania, whether you are an laid off steel worker or an underemployed poet, the circumferences are somewhat the same. Enough politics, is opera really designed to make us think? Based on Scenes de la vie de Bohème by Henry Merger, the story of the starving garret-bound artist, Rudolfo, and his consumptive lover, Mimi, may be thin, but it’s hold on our romantic imagination looms large, as evidenced in all the offshoots such as Rent, Moulin Rouge, and a host of other bohème imitators. It’s basically a poet meets seamstress, falls in love, gets cold feet, poet returns to seamstress too late, plot. Oh, and their rent is late too. For once, there are no complicated plot twists. It’s just enough of a story to give rise to some of the most melodic opera music of all time. Soprano and HGO studio alumna Ana Maria Martinez sings Mimi with restraint and depth, lending a quiet authority to this frail yet flawed character. Martinez gains momentum as the opera progresses and reaches her peak on her death bed, or better yet her, death mattress thrown on the floor. Tenor Garrett Sorenson is one to swoon over with his pure sound and endearing boyish charm. Sorenson captures the duplicity of the role well. The befuddled Rudolfo is jealous and worried that she might die. Which is it buddy? The imperfect love of Mimi and Rudolfo alone, combined with tear- inducing love arias, makes this opera occupy a permanent address in our pysche. Joshua Hopkins, also an HGO studio alumnus, sings Marcello with a dashing swagger, a rich tone, and convincing acting. Russian soprano and current HGO studio member Albina Shagimuratova plays Musetta with a juicy virtuosity and full-bodied sound. Shagimuratova steals the second act with her non-stop voice and magnetic stage presence. Strong performances by Nikolay Didenko, Christopher Feigum, Gwynne Howell and Beau Gibson completed the performance. James Robinson’s direction contains a self referential node to the mythic position of Bohemia, amplifying its charm and vitality at first, while slowly giving way to its emptiness at the conclusion. Allen Moyer’s cave-like ramshackle apartment isolates the action in a tight container surrounded by austere dungeon-looking walls. In the opening act, the garret itself is a lively place, with a colorful mural, and makeshift furniture. At the end, we see the walls painted a pale white, echoing Mimi’s death mask, surrounded by muted tones. The fellow bohemes retreat to outer walls as if to hold on to whatever shred of life is left. Rodolfo crouches over his dead Mimi; his sorrowful sobs are the last thing we hear in this grim but utterly stunning final scene. He get its it, the heat of love is not substance enough, you actually need the real stuff, as in money to pay the heating bill to carry on. The children’s chorus, under Karen Reeves direction, added zest. Patrick Summers and the Houston Grand Opera Orchestra delivered a crisp and luscious performance of Puccini’s masterwork.